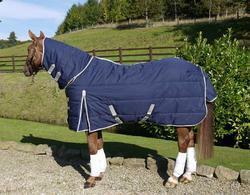 Our range of products include horse stable blankets and horse stable blanket combo. These stable blankets provide warmth as required during winter days but they are not waterproof and are best suited to be used when horse is in stable. We can provide you 2000pcs on a monthly basis. Please do mail us your trade inquiries. These stable blankets with neck cover are best during high winter seasons and sowfall when you require your horse to be fully covered till neck. - Double velcro flap closures at neck cover.